Over the past two decades, Dr. Jennifer Buchanan has found many ways to make the local community smile. From the thousands of spectacular smiles she creates for her orthodontic patients to the popular, annual SMILES Charity Concert and Family Festival whose profits build homes for wounded veterans; from annual shoe drive for local students to her Halloween candy buy-back that’s seen thousands of pounds of candy donated to our troops, Dr. Buchanan makes our community smile. During the month of December those smiles are even brighter, thanks to Dr. Buchanan Orthodontics’ annual toy drive. Over the past 18 years, with help from her patients and their families, Dr. Buchanan has donated thousands of Christmas toys to local kids from lower income families. This year’s toy drive is in full swing with local high school cheerleaders and honor roll students helping collect toy donations to be distributed through WFAA’s Santa’s Helpers program. You can help by bringing new unwrapped toys to Dr. Buchanan Orthodontics by December 8th. Dr. Buchanan Orthodontics has helped thousands of patients of all ages realize a better-looking and healthier, better-functioning smile. Together with a staff with an amazing 150 years total combined experience, Dr. Buchanan embraces the very latest orthodontic technology while maintaining a highly personal touch, with Dr. Buchanan herself seeing every patient on every visit to the office. 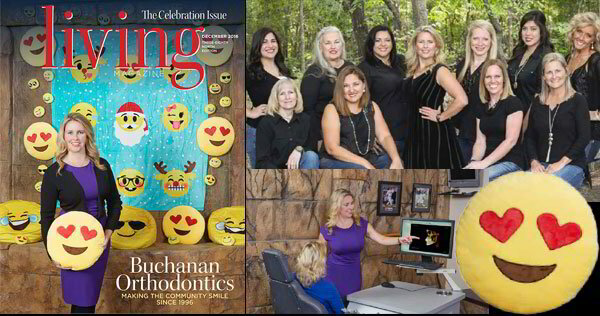 Dr. Buchanan Orthodontics stays on the cutting edge by offering i-CAT Imaging which allows Dr. Buchanan to obtain 3-D images of a patient’s mouth, right in her office. State-of-the-art Lythos Digital Scanner has helped her do away with gooey, messy models of patients’ teeth. Impressions are taken digitally, in-office, much quicker than ever before. “And the Damon System allows me to achieve full, natural, 10-tooth smiles with light biologically-sensible forces, specifically designed to improve the overall facial result of each patient, without extracting teeth and without the bulky head gear like I wore as a child,” she said. One of the most exciting advancements in Dr. Buchanan’s 20 years in practice is Insignia Braces, which allow Dr. Buchanan to offer each patient 100% customized brackets and wires that fit their teeth—and only their teeth—for more precise treatment. Beginning with 3-D software representation of their exact tooth positioning, Dr. Buchanan can show each patient their finished result before they even begin treatment. Then each bracket is precisely calculated to affect their unique tooth movement in the most optimal way, resulting in fewer office visits, shorter office visits, and exemplary results. Every year Dr. Buchanan awards several orthodontic scholarships to deserving patients. She promotes dental health at local schools, sponsors local sports teams, provides career guidance for students interested in dentistry, and hosts CPR training for dental professionals. She and her team honor appointment times and offer early morning and late evening appointments to accommodate patient’s schedules. They’re now accepting new patients. Call (972) 542-4412 or visit McKinneyBraces.com to schedule a free consultation.